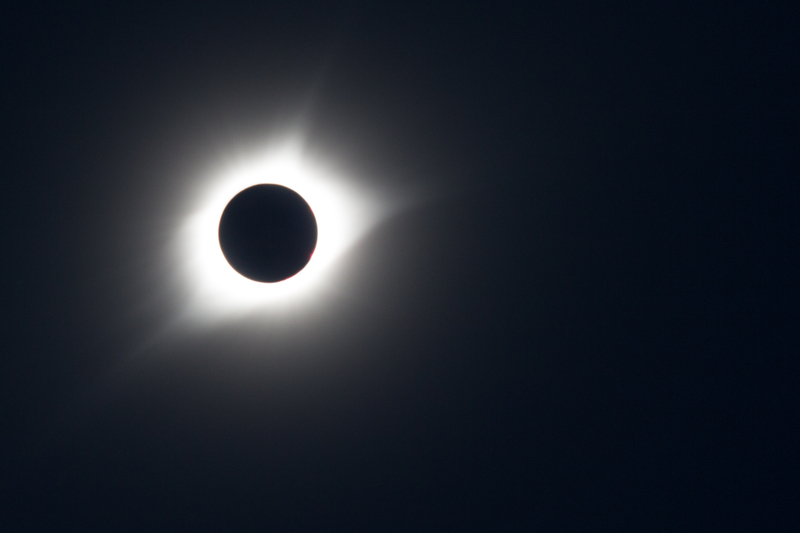 Yesterday a reported 200 million people were within a day’s drive of witnessing totality for the 2017 solar eclipse across the United States. We were among those number and closer than most. 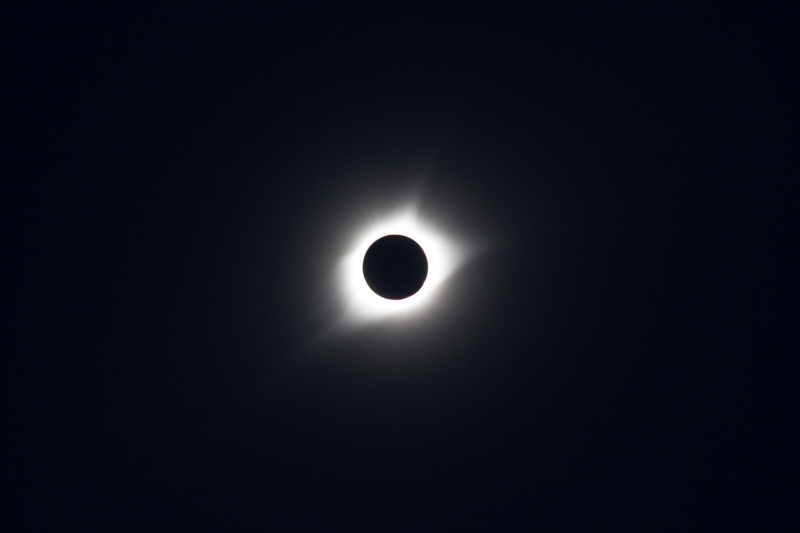 We live approximately two miles southwest of the edge of totality, so we knew we had to give a trip to the area of totality the good old college try. We found what turned out to be a spectacular (and perfect) location approximately fifteen miles north of us. 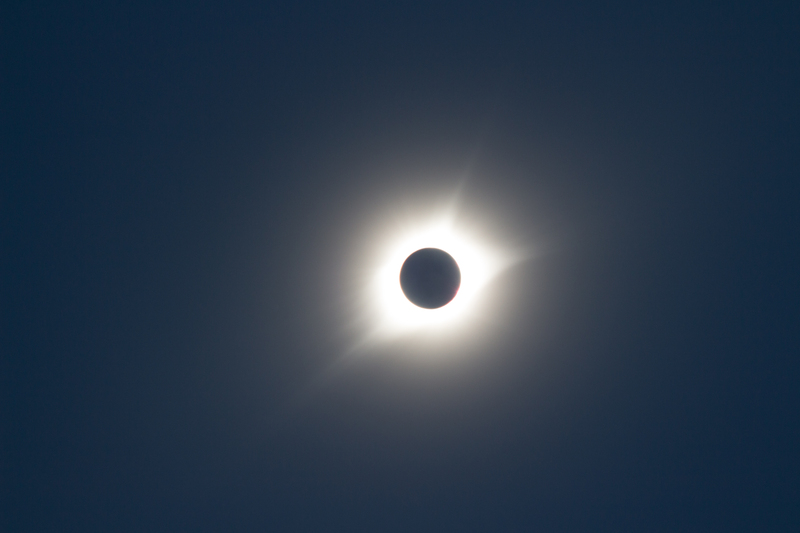 We departed with our loaded vehicle at about 5:00 a.m. Totality commenced at approximately 1:10 p.m. and lasted just under two minutes. 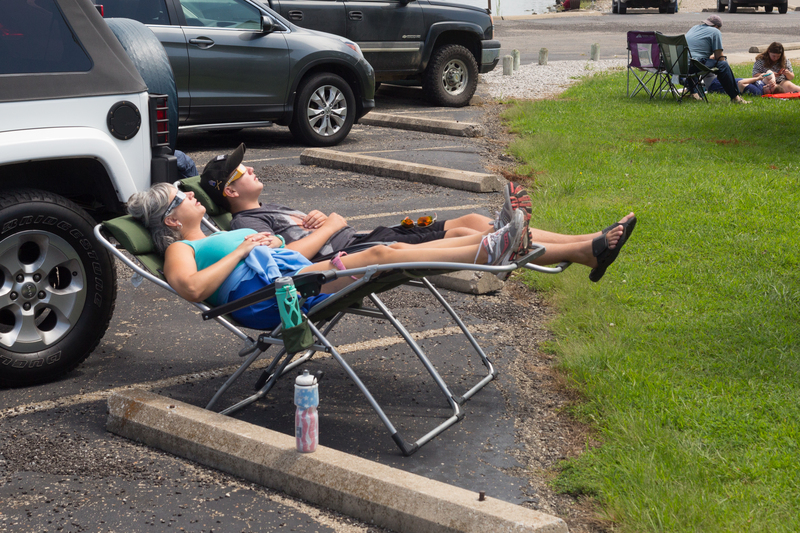 If traffic was impossible we had a plan B location approximately half the distance with one minute of totality. Traffic was never a problem, probably due to weather forecasts and the perception of iffy cloud cover and storms immediately before totality. Our planned load included three people, at least six cameras, assorted tripods, two laptops, two small tables, three lawn chairs, two cases of water, umbrellas (for shade and any rain while we waited), food and drink in two coolers, toilet paper, insect repellent, solar eclipse viewing glasses, a small pinhole viewing box and a long pinhole viewing tube. All batteries and phones were charged, I guarantee it. 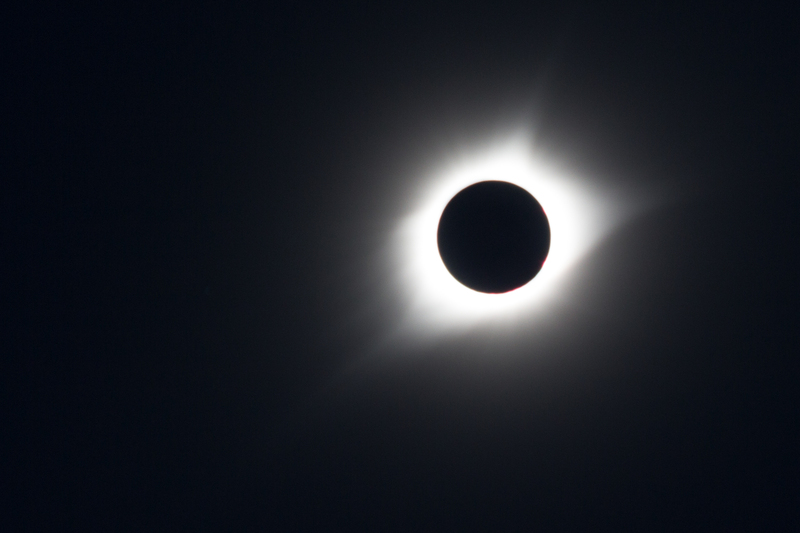 We didn’t acquire solar filters for the cameras so we planned on taking photos during totality. Timing turned out to be everything. 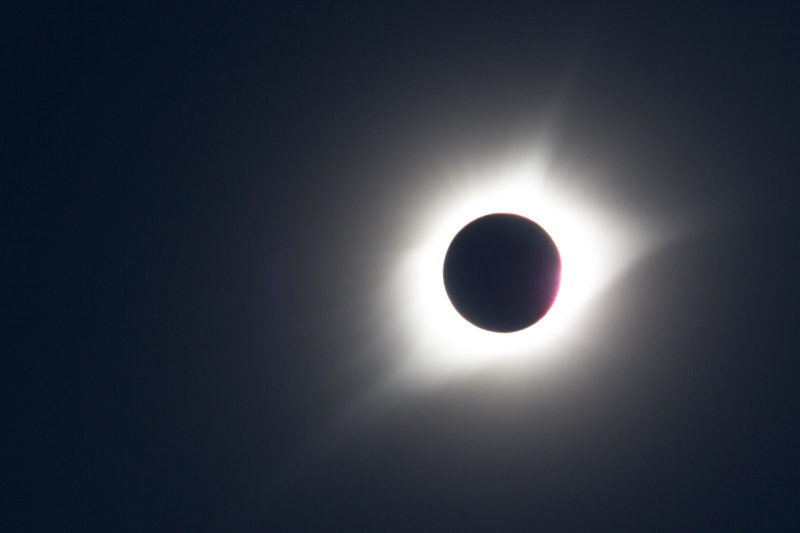 No one was willing to risk their higher end full frame camera sensors to the sun, so we used older cameras operated remotely in live view from laptops. It’s a little clunkier way to operate, but we were not willing to risk our eyesight through the viewfinders. We figured if we got some images, great. If not, it would still have been an adventure. 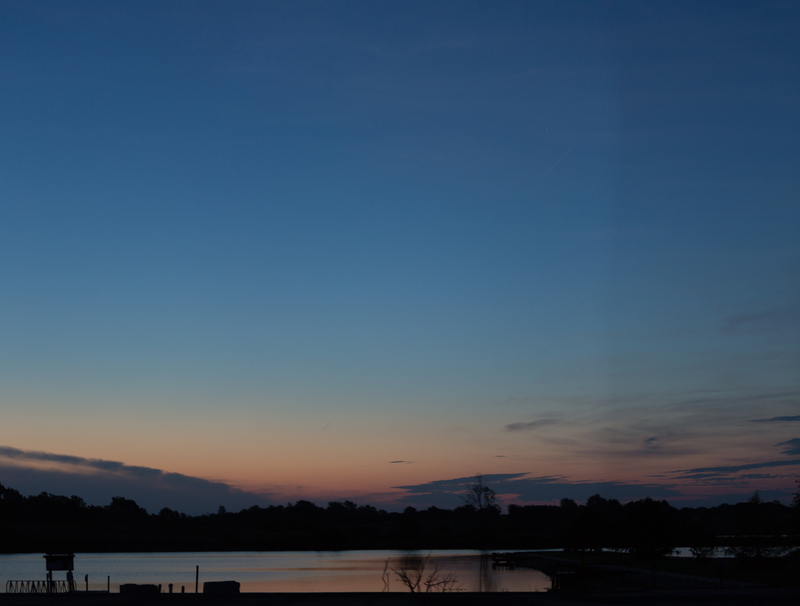 Sunrise at Maple Leaf Lake Conservation Area, Lafayette County, Missouri – August 21, 2017. Fishing before the big show. 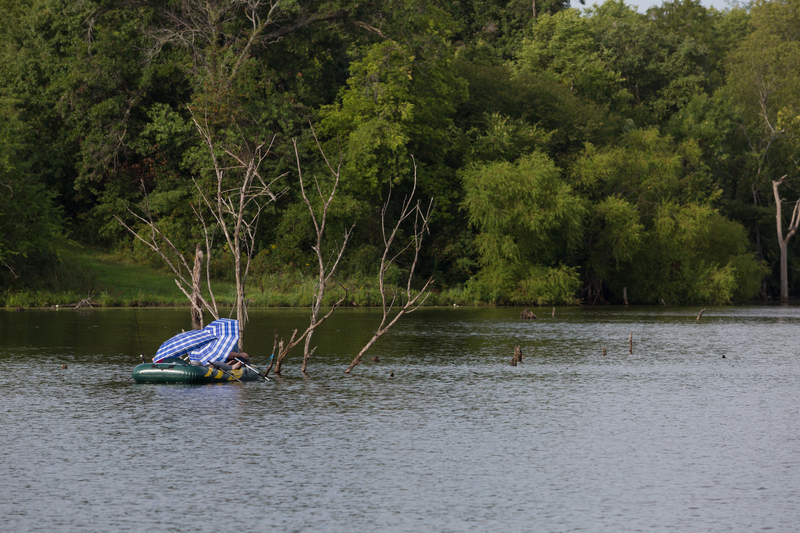 Our two vehicle encampment and set up for watching and photographing the solar eclipse yesterday at Maple Leaf Lake Conservation Area, Lafayette County, Missouri – Left to right, my Canon T4i, with 70-200 mm F 2.8 lens (set to 200 mm, F 4, manual focus to infinity – lens front covered in foil until totality) on a tripod tethered to my laptop (covered in black cloth so I could duck under it in the sunlight), my old Canon XT with an 18-55mm kit lens with an intervalometer set to one minute on the roof of the vehicle, pointed at the horizon, two others in our party, Jerry Schmidt with his Canon T5i and 300 mm F 2.8 lens tethered to his laptop (on his nifty shrouded laptop stand), and Jerry’s awesome pinhole viewer, also attached to a tripod. We used the pinhole viewer more than we used our eclipse glasses. Note the clouds behind us. There was a very nice couple from Arkansas parked next to us. As the intense light source gets narrower the edge of the shadows get sharper. 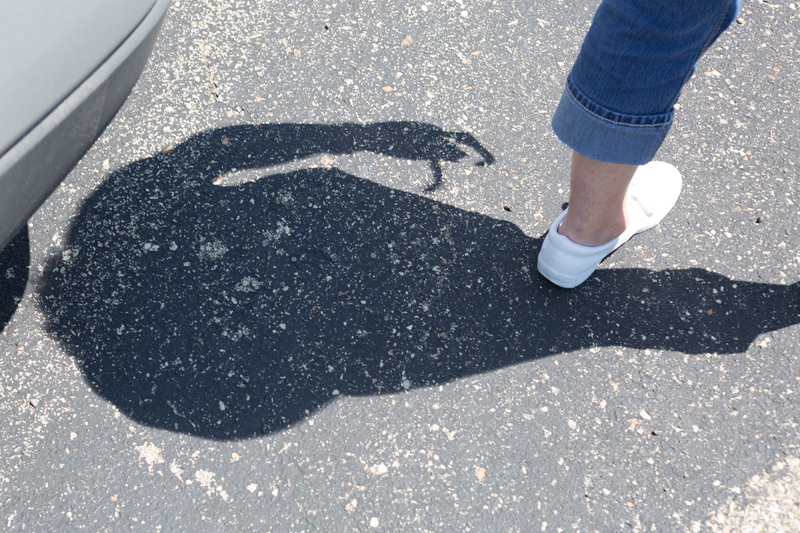 We also witnessed the effect of tree leaves as natural pinhole projectors of the eclipse on the ground. The sky was relatively clear until about 10:00 a.m., then we had thick overcast with thunder and lightning to the northwest, along with raindrops. The area steadily filled with vehicles as six individuals in vehicles from the Conservation Department monitored the area. 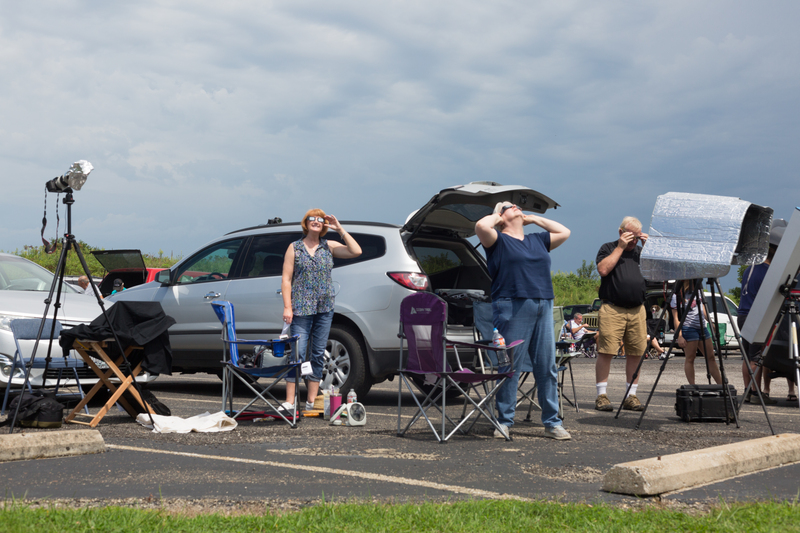 The sky cleared about twenty-five minutes before totality, much to everyone’s relief. 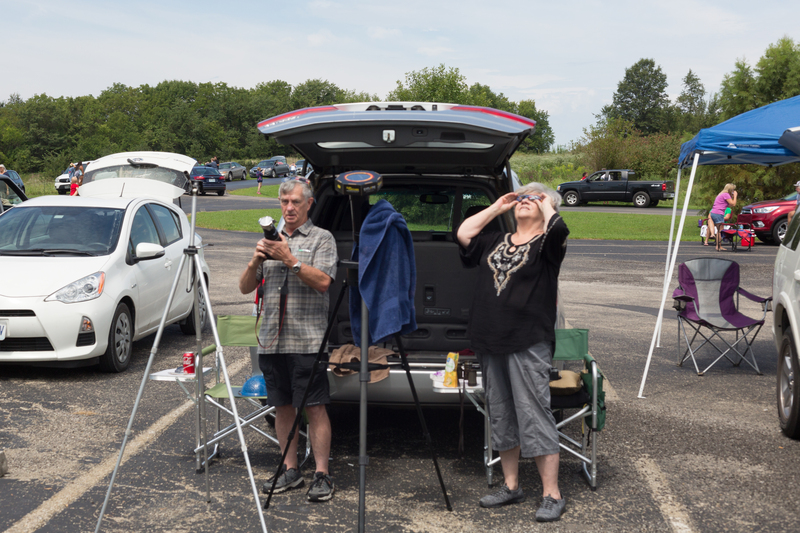 After a few hours of quiet, a little bit of boredom, and socializing with our neighbors, the final half hour was a whirl of activity as we set our camera and observed the progress of the eclipse. Michael Bersin. @1:09 p.m. Central, August 21, 2017. Lat. : 38.9883° N, Long. : 93.7971° W. Maple Leaf Lake State Conservation Area, Lafayette County, Missouri. F 4, 1/30, ISO 200, 200 mm. F 4, 1/20, ISO 200, 200 mm. F 4, 1/6, ISO 200, 200 mm.